Bertrand Mattei at Fraser Yachts has just signed the 33.7m trideck motor yacht Sea Shell for charter in the western Mediterranean. Built by Fittipaldi Yachts in 2010, she is an ocean-going superyacht, with spacious accommodation and a sun deck and swim platform. Her luxurious interior includes a full beam Owner’s Suite with panoramic views and an office area, two VIP cabins with queen sized beds and two twin cabins for 10 guests. All rooms are equipped with ensuite facilities. There is a saloon and dining area as well as a deck area with space for 10. 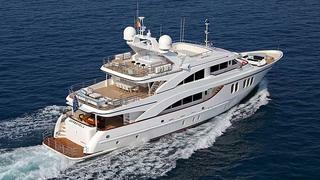 Sea Shell is available for charter at weekly rates starting from €85,000 in high season and €72,000 in low season.